Or Silver Strand, Co Mayo if you are finding it hard to pronounce the name above. Peter Cox, Roger Overall and myself also knows as “Circle of Confusion” spent a couple of days in Westport scouting for locations for the next episode of “The Dynamic Range” video series. Since i know the Westport, Co Mayo area the best as we go there nearly twice a year for family holidays it was left up to me to find suitable locations. Well you will have to go The Circle of Confusion website and listen to the podcast along with the short video filmed my our Director, Roger to see how I did. AllI will say is that we came away for the couple of days very pleased and we even got to take a couple of images also. This was not the prime reason and at time we turned away some wonderful opportunities to take some photos as it was not plan for this trip. However Roger did let Peter and myself of the hook at Silver Strand once all the pre-production work was done. The light was only magic and lets hope we get this light again in March when filming starts. 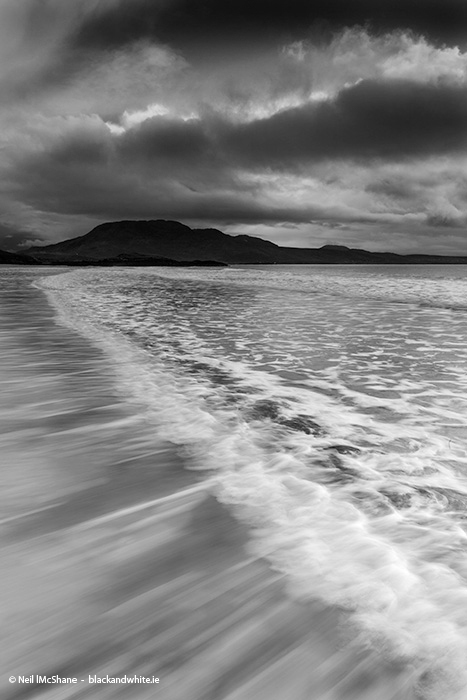 The image above is form Silver Strand looking south along the beach as the tide was coming in. Using a slow shutter speed in combination with the grad filters to capture the lovely flow of the water. I have a couple more image from this location as you shoot in any direction and come away with some wonderful images. So stay tunned to see some more from Trawl………. Silver Strand. You can really get a sence of light, sound and the smell of the sea. Ireland for my holiday this year I think! Thanks Tim for your comment. Ireland has to be on your list for a holiday but don’t forget the camera for a snap or two. Just the time and composition on that image. Sweet.